Italian songs for solo and duo, recorded in a beautifully sounding space in one single session. 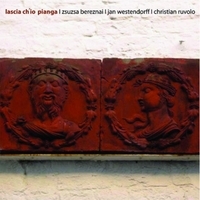 This session with arias and duets for soprano, baritone and piano, was recorded on November 07, 2008 at the chamber music hall of the Musikhochschule Luebeck. The miking was puristic, with a spaced pair (51.5 cm) of omnidirectional microphones custom-built by United Minorities and two spot microphones placed under the piano (DPA 4060). There was no artificial reverb added in post.